Hey there, everyone! I apologies for the lack of updates from yours truly as of late. I recently sold my computer and only just got my laptop. It’s been pretty hectic between that and packing up for my move to South Korea. I leave in two weeks! Craziness, I say! 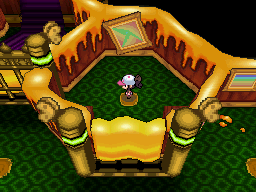 So, for this next article of Gym Leaders: Untamed, we’re going to be discussing Black and White’s third gym, Burgh. This particular leader uses Bug -type Pokemon. To be quite honest, I’ve always found this particular gym to be quite easy. Bug types were never known to be that strong. Black and White, however, has introduced a slew of new and strong bug types. Regardless, Burgh is not too tough. There are a couple of things that you can do to prep yourself for this fight. First and foremost, go straight to a vending machine and purchase at least a dozen lemonade. It’s only 350 Poke-dollars (or whatever they call it. I really don’t know). This heals 80 HP, significantly more than a super potion, and costs half the price. It’s a no brainer when I say that this should be your main healing item for a while. It’s both inexpensive and effective, so stock up! Another thing to note is the NPC on the south east pier who will give you an elemental stone for your monkey. Evolve it ASAP; giving it an extra edge in battle with some stat boosts. If you obtained Pansear, I suggest leveling it so it learns Flameburst before you evolve it. It’s a base 70 power move with an extra kick with the fire STAB, which will prove useful during the next gym fight. I always thought this was a slow part of the game; it’s rather heavy in story and there aren’t many decent pokes to train around. There are, however, quite a few trainers to defeat at the Battle Company, which is the second house on the left in the front of the city. Defeat these trainers so you can level up your team for the big fight. You can also obtain an Exp. Share at the top of the same building. This would definitely be helpful if you’re trying to gain a few quick levels for inexperienced teammates. Other than these few items, there really isn’t much to do in this huge city. Sure there are lots of buildings to explore and people to talk to, but as far as anything that’s actually useful, that’s really it. The TM’s you obtain here are mediocre at best; filling only niche roles NPC battles. Alright, enough of this prep talk. Let’s get started with the actual fighting! Burgh uses a level 21 Whirlipede, 21 Dwebble and a 23 Leavanny. The levels of my team for this fight were all in the mid-low 20’s. I didn’t level much after beating Lenora as I chose Tepig, which makes this fight laughably easy. Snivy makes this a tad more difficult because of the bug-types you’ll be facing, but if leveled Pansear can make up for this downfall. If you chose Oshawott, you’ll have a few more limited options. Blitzle learns Nitro Charge at a low level, but it’s not very strong and Blitzle is rather frail. Pidove is another, more reliable option due to the resistance it carries for bug/grass types and also a STAB Air Slash. A thing to note if you use Pidove is Dwebble’s Smack Down, which will do some serious damage if not 1HKO you. I would suggest starting out with your main Pokemon for this fight, i.e. Blitzle, Pidove, Pansear, etc. to take out Whirlipede. Switch out to a secondary Pokemon for Dwebble. Any will do that isn’t weak to rock or bug. A water type like Panpour or a fighting type such as Timburr will take him out easy while the ladder being resistant to attacks. Save your main Pokemon for Leavanny, because you’re going to need it. Leavanny is high in attack power and has an interesting dual typing. Even with a teammate who resists grass and bug attacks, they’ll still take considerable amounts of damage. While Struggle Bug is semi-strong and contains STAB, Razor Leaf is stronger and has a high critical hit ratio. If you have a fire or flying type in your team, this fight should be rather easy. If you really need to, use some of those TMs you obtained to hinder your opponent. Flash will lower the accuracy of opposing Pokemon, and Attract will render your opponent immobile for the majority of the fight. These should be used as a last resort, though, as they’re rather unreliable. Good luck, trainers! Make sure to do some leveling for the next gym leader. You’re going to need it, as she’s one of the more difficult trainers in the game. Heck, even the series! Happy training!